When car accidents occur, it is important to hold the negligent parties accountable for their actions. By filing a personal injury lawsuit, you are forcing the defense to explain their version of events. However, unless you are a lawyer, you are probably unfamiliar with every aspect of personal injury law. Our attorneys are here to answer all of your questions and address any concerns that may arise during litigation. If you were involved in a car accident and suffered a serious injury, then we will help you craft a successful legal strategy. At Lampert & Walsh, LLC, our attorneys will keep you informed and help you feel confident about your injury claim. For over fifteen years, our firm has focused on protecting accident victims through civil litigation. We have decided to only represent injured plaintiffs and will not protect insurance companies in court. Due to our commitment to car accident victims, our attorneys are well-received by both our clients and peers. We are widely considered to be one of the premier personal injury and accident law firms in Aurora and Denver. 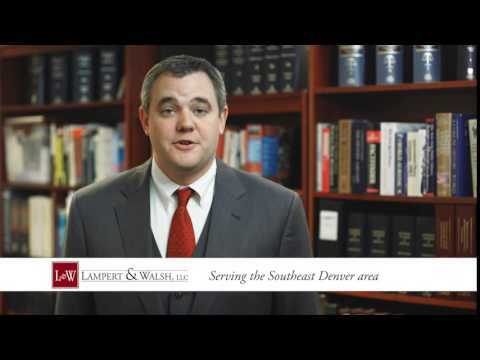 At Lampert & Walsh, LLC, our Denver accident lawyers aim to keep you engaged throughout the legal process. Our ultimate objective is to procure you a reasonable financial settlement, and we will work hard to achieve this goal. What is the difference between a claim and a personal injury lawsuit? Should I speak to an attorney before contacting an insurance company? Why do I need an attorney to handle my accident case? I was partially responsible for my personal injuries. Do I still have a case? What damages can I claim in a Colorado personal injury lawsuit? What happens if the at-fault party is uninsured? Can I still file a claim? Can I afford to hire a Colorado personal injury attorney? What Is The Difference Between an Insurance Claim and a Personal Injury Lawsuit? Making a claim is usually the first step on the path to recovering compensation for an injury. After an auto accident, you can file a claim with an insurance company. Our Denver personal injury lawyer will ensure that you receive the maximum amount of compensation from this company. However, if they refuse to comply, then we will take your case to court. You should speak to a Denver personal injury attorney. Not everyone who is injured in an accident has a viable compensation claim. It is important to provide your attorney with as much information as possible. This will help him or her make the best decision regarding the viability of your case. If you are injured, then you should immediately seek medical attention. Medical professionals are there to make sure your injuries do not get worse. After seeking medical attention, you should take pictures of the accident scene. By documenting the damage, you have evidence that can be used in negotiations or at trial. Finally, it is important that the police create an accident report so they can document what happened during the collision. This will help them determine who was at fault for the accident. It is okay to contact your insurance company and tell them about your accident. However, do not communicate with the other driver’s insurance company without first speaking to an attorney. A claims adjuster will try to limit what they owe an injured party. These individuals are not on your side, and they should not be given the benefit of the doubt. Before speaking to a claims adjuster, you must have an attorney present who can help protect your rights. A Denver personal injury lawyer can maximize your compensation claim and advocate for you during difficult moments. Personal injury cases are covered by statutes of limitations, which regulate the amount of time you have to make your claim. Contact Lampert & Walsh, LLC right away to learn more about what we can do for your case. In Colorado, the comparative fault rule is used when determining legal fault for an accident. The comparative fault rule reduces the amount of damages that you can recover in a negligence-based claim. It is based upon the degree to which your own negligence contributed to the injury. For example, a judge or jury may determine that you are twenty percent responsible for your own injuries. Using the comparative fault rule, you would be eligible to receive eighty percent of the awarded damages. However, in order to recover damages, you must not be more than fifty percent at fault for your injuries. When filing a Colorado personal injury lawsuit, you can claim economic and non-economic damages. Economic damages are your personal injury losses. They are easy to add up, because they directly affect your wallet. They include medical bills, lost income and property damage. Non-economic damages are inexact damages that are difficult to calculate. They include pain and suffering and emotional distress. Calculating these damages requires the assistance of a qualified attorney. After a car accident, you should send a claim to the insurance company to compensate you for your injuries. However, the insurance company may try to compensate you as little as possible for your injury claim. If this occurs, then you should file a lawsuit with the court. Once you enter litigation, you are not just dealing with the insurance company. You are also dealing with the defense and his or her legal representation. If you have uninsured motorist coverage (UIM), then you can get your insurance company to cover your medical bills and property damage. You can still file a civil suit against an uninsured driver, but it is unlikely that you will receive any monetary compensation. Drivers without liability insurance typically do not have a lot of assets or resources that you can use to recover damages. However, if they do have assets, then you can use that as leverage and bring them to the negotiating table. The simple answer is yes. At Lampert & Walsh, LLC, our attorneys work on a contingency fee basis. This means that we do not get paid unless you recover compensation for your injuries. Our initial consultations are also free of charge. We want you to feel comfortable using our firm for all of your personal injury needs. By working for contingency, our attorneys will strive to make sure that everyone involved gets paid. Although car accidents occur frequently, they should not be taken lightly. This might be your first personal injury claim, and an insurance company or defense attorney will take advantage of your inexperience. Our Denver accident lawyers will work hard to guarantee that no party takes advantage of your situation. We will help you pick out a legal strategy that gives your case the best chance for success. If you have questions about Colorado car accident law, then you should contact Lampert & Walsh, LLC today at 720-489-5848 and schedule a consultation. You can also contact us online and send us a brief description of your case. We promise to answer all of your questions and make you feel at ease about your current situation.